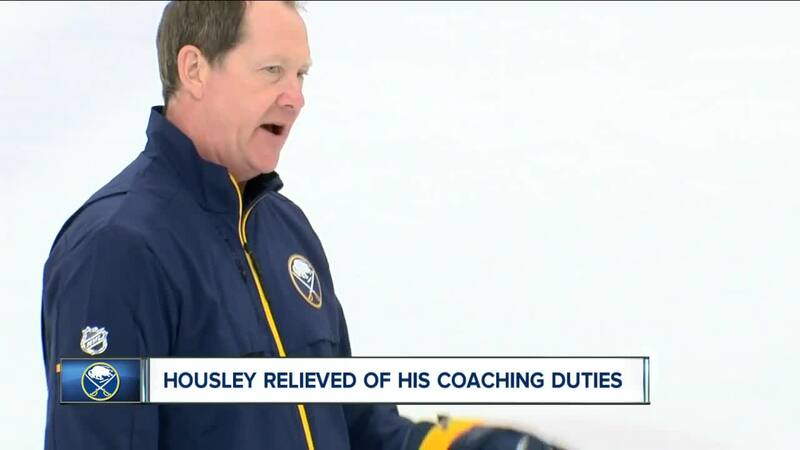 BUFFALO, N.Y. (WKBW0 — Phil Housley's tenure with the Buffalo Sabres has come to an end after two seasons. On Sunday the team announced Housley had been relieved of his duties after his second consecutive season missing the playoffs. Despite a strong start to the 2018-2019 campaign, the Sabres historic collapse after their 10-game win streak ultimately sealed Housley's fate. The Sabres were officially eliminated from playoff contention on March 23 with eight games left to play. As the head coach of the Sabres, Housley led the blue and gold to two of the worst seasons in franchise history, including a last-place finish [25-45-12] in 2017-2018. His second season was better, but not by much, as the Sabres limped to the finish line with a [33-39-10] record. When asked about Housley's future at the NFL Owners Meetings on March 26, Sabres owner Terry Pegula said: "Phil communicates with the players well. Are we happy with how the season is going? Absolutely not, you can ask anybody on the team. So something has to change but we don't know what. We're all going to put our heads together and talk about it." Housley becomes the third coach to be fired after two seasons [or less] with the Sabres since November of 2013, joining Ted Nolan [2013-2015] and Dan Bylsma [2015-2017].